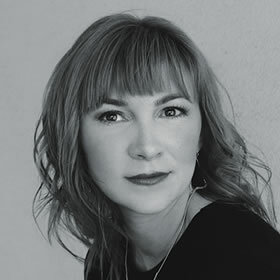 Editor’s Note: Kim Walker Smith is a singer-songwriter, worship leader, and founding member of the Jesus Culture, a global worship movement. This post is an excerpt from her memoir Brave Surrender and talks about a time when she felt God prompting her to move on from her home in Redding, CA. The Lord began to remind me of story after story from the previous few years in which I could see the faithfulness of God and trust his voice inside me. One of my favorites was the time my phone broke during my second year of ministry school. I was living in a small, second-floor apartment with a friend who was also attending the school. We both worked part-time jobs because of our school schedule, and I struggled to make ends meet, often supplementing my groceries with donations from the church pantry. I had a landline telephone that I used to stay connected to my family, usually calling collect. One day I picked up my phone and realized it wasn’t working. I knew I had paid the bill. I unplugged it and plugged it back in, but it wouldn’t turn on. Feeling hopeless, I started crying. It was my only means of communication with my family and I couldn’t afford to replace it. Suddenly I felt Holy Spirit show me a picture. I saw inside the body of the phone and I saw myself inserting a penny into a very particular spot. What a weird picture! Deciding I had nothing to lose, I grabbed a penny and opened the phone. The wires and various electronic components looked just like what I had seen in my mind. I saw the spot where I needed to slide the penny. I slid it in carefully and then put the phone back together, set it on the base, took a deep breath, and held up the receiver to my ear. A dial tone! It worked—and that phone never had a problem again. To this day, I have no idea why the penny worked. All I know is that God proved he can be trusted to bring solutions to my problems. He loves to take care of me. When we went into the grocery store, the man grabbed a cart, went straight to the baby section, and picked out a small package of diapers, formula, and baby food. Then he went and got milk, meat, and a few cans of soup. My heart broke to think that he had a baby he was struggling to feed and was in a position to need this help. When I paid for the items in his cart, the total came to 70 dollars—all the money I had. After we walked out, I prayed for him, and he thanked me over and over, with tears streaming down his face. Only when I drove away to school did I start to wonder how I was going to eat that month. I burst into tears. My Jesus, the one who doesn’t abandon me, had again taken such good care of me. It was this history of his faithfulness that finally gave me the courage to leave Redding in response to God’s prompting. A few people in my church didn’t think it was a great idea, but I stuck to my guns. I was determined to trust Jesus and step out into unknown waters. I was ready for something to shift inside of me. Adapted from Brave Surrender: Let God’s Love Rewrite Your Story by Kim Walker-Smith. Click here to learn more about this title. Kim Walker Smith’s passionate performance of “How He Loves” helped transform Jesus Culture into a global worship movement. 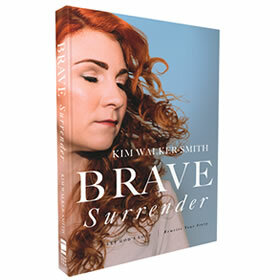 Brave Surrender is the story of how Kim journeyed from a place of shame and fear to stages around the world where she boldly proclaims the unconditional love of God. Through her own story, Kim inspires us to experience true freedom and healing with Jesus. Coming from a painful childhood, Kim struggled to believe that God could heal her heart or bring any sense from her past. Yet when faced with the choice to hand her struggles over to God and receive His love in return, everything began to change. On the other side of surrender, Kim began a journey of looking at one painful memory at a time with God and exchanging her perspective for His truth — a journey in which God rewrote her story of pain into a story of redemption and hope. Kim Walker-Smith is a singer-songwriter, worship leader, and founding member of the Jesus Culture, a global worship movement. For over fifteen years she has played a major role in influencing worshippers and worship teams around the world toward a passionate pursuit of Jesus. Today Kim lives just outside of Sacramento, California with her husband Skyler, their two boys Wyatt and Bear, and daughter Maisie. When she’s not leading worship at her church Jesus Culture Sacramento, she travels internationally to lead others into genuine encounter with Jesus. You can keep up with Kim on Twitter, Facebook, and Instagram. The post When Trusting Jesus Means Stepping Out into Unknown Waters appeared first on Bible Gateway Blog.